It was a beautiful day on a long holiday weekend, and I was considering what to do when I came up with a brilliant idea. 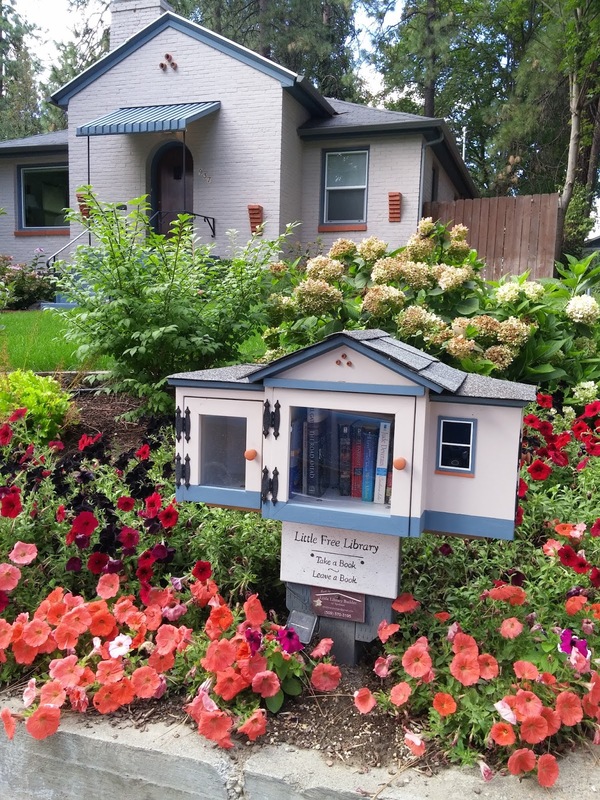 Why not do a Little Free Library tour in Spokane, WA? Since I’m not too familiar with the area, I got my son to be the tour guide. Along with him and my sister, we hit a goldmine of Little Free Libraries on the South Hill. Their eagle eyes kept spotting one library after another and I was in heaven! Here’s a glimpse of our day. Sushi and peach sake at Sushi.com in downtown Spokane—awesome way to start the tour! And on with the tour. 1st Stop. 18 W 13th Ave. We start off with this beautiful little yellow and green library. Here I left one of my favorite books, The Guernsey Literary and Potato Peel Pie Society by Annie Barrows and Mary Ann Shaffer. I loved this book so much, I ordered a hardback version of it, and that’s why I could part with my paperback version. 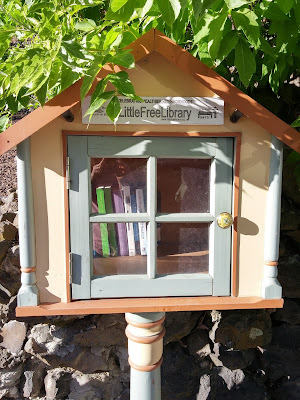 At this cute little library I left another book I enjoyed, The Curious Incident of the Dog in the Night-time by Mark Haddon. I took The Absolutely True Diary of a Part-Time Indian by Sherman Alexie. I know, it’s a young adult book, but I had heard a lot about it and am looking forward to reading it. 3rd Stop. 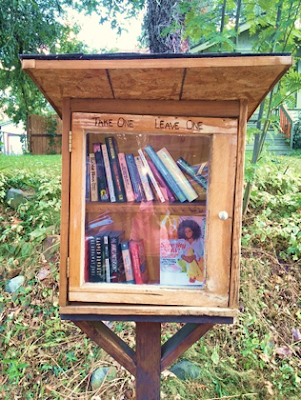 13th Ave. At this well-loved, rustic little library I left The Chili Queen by Sandra Dallas. I took one of Oprah’s book club recommendations, The Pilot’s Wife by Anita Shreve. 4th Stop. 1603 13th Ave. 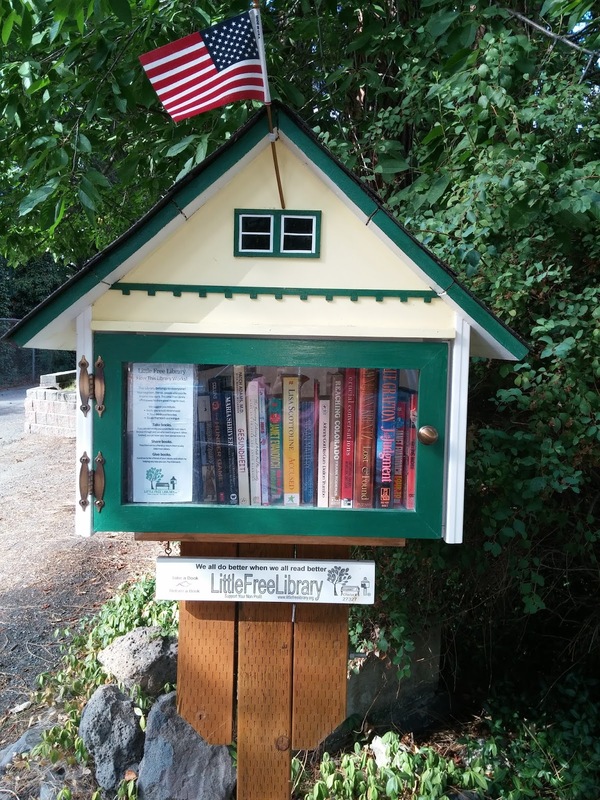 I can’t say enough about this beautiful little library! These stewards seem to take a great pride in getting their neighborhood involved in reading. They are so welcoming, they even had a container of water bottles for people to take. I was excited about the offering and took one (sushi left me thirsty). What a nice gesture. Thank you! I left The Light Between Oceans by L.M.Stedman, which is finally coming out as a movie. I took An Unexpected Guest by Anne Korkeakivi. Sounded interesting. 5th Stop. 16th Ave. Another gem of a library. 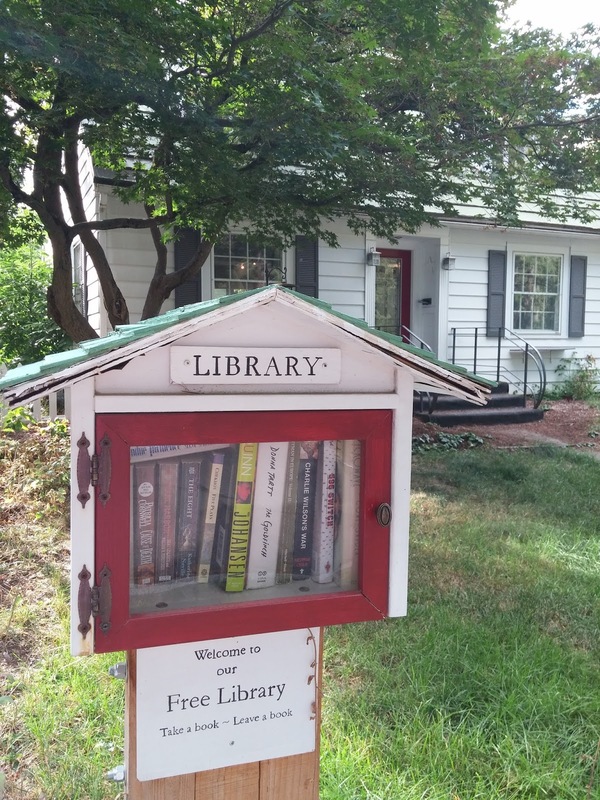 This beautiful library matched the house! It had three different doors on it. I left another one of my favorite books, The Other Side of Midnight by Sidney Sheldon. Beware: this book is hard to put down. Ask my husband. I ignored him on my honeymoon to finish it. I took Bossy Pants by Tina Fey. 6th Stop. 20th Ave. Talk about awesome, this library is a boat!! It has a porthole for the window and the door handle is a ship steering wheel. On the Little Free Library map it states that the library is a memorial to Lois Nichols who loved teaching children to read. What a wonderful way to honor her. I left a good, but heartbreaking book called Into the Wild by Jon Krakauer. 7th Stop. 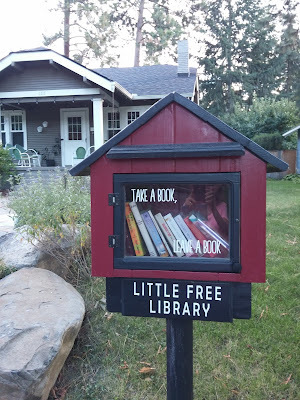 Park Ave. Another library that matched the home, this little guy was right across from Manito Park, the Duncan Garden. Two beautiful things right in front of their home! I’m hoping they have kids, because I wasn’t expecting so many libraries and at this point I only had children’s books. I left them one of my favorite kids’ books, Charlotte’s Web by E.B. White. Hope they can find a good home for it. Time for a break. Now we had to check out the beautiful Manito Park and conservatory. 8th Stop. 20th Ave. After our little break, my son spotted this nice little library. I left a kid’s book Rotten School by R.L. Stine. 9th Stop. 21st Ave. At this point we should have stopped the tour, because I had completely run out of books. I would have brought more if I had known the South Hill had so many book lovers. But who could resist passing up this library? So I gave up a book I had just acquired. I gave them The Pilot’s Wife so I could take It’s Tigger Time for my granddaughter. 10th Stop. 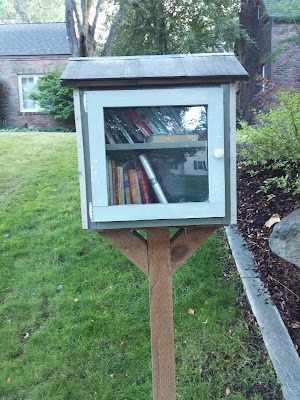 21st Ave. We had come this far, and now my son and sister thought we should hunt for just one more to make it an even ten libraries. And look what they found! This is another beautiful library that matches the home. Again, I had to leave a book I had just acquired, An Unexpected Guest by Anne Korkeakivi. Hope it’s as good as it sounded. I took a book I had already read in the past but didn’t own: The Call of the Wild by Jack London. Bonus Stop. 11812 E Sinto Ave, Spokane Valley, WA. 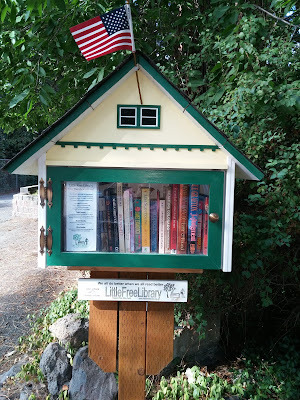 Before we had met with my son in Spokane, my sister and I had stopped at one library in the Spokane Valley. What a creatively original and fun library it is! It's an old newspaper stand painted a bright and cheery blue. 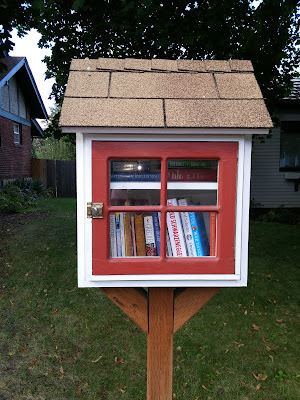 Here I had left His Majesty's Hope by Susan Elia MacNeal, a book I had picked up at a Little Free Library in Belle Fourche, South Dakota. I took Oh, the Thinks You Can Think by Dr. Seuss. Well, that’s it. What fun! What a tour! Thanks to all of the stewards of the Little Free Libraries. And thanks to my son and sister for feeding my addiction. I only wish my mom, who was an avid reader, could have been here with us.